This was simple and so flavorful. I also love that it can be served warm, cold or at room temperature. It would be perfect for picnics, potlucks, or parties because it makes so much too. Parmigiano Reggiano is a must for this and the vinaigrette is light and a perfect complement to this salad. We ate this alongside this tilapia dish, which I am going to have to make much more frequently! Thanks for reading, enjoy! Bring 2 large pots of water to boil. Add a big pinch of salt in each. To one pot, add asparagus and blanch, about 2 to 3 minutes, depending on the thickness of your asparagus. Place blanched asparagus in a bowl of ice water to stop the cooking and keep them green. To the second pot, add the orzo. Cook per package instructions. When tender, drain and place in a large bowl. Add blanched asparagus and tomato halves. Mix olive oil, lemon zest, lemon juice, garlic, salt and pepper in a small bowl. 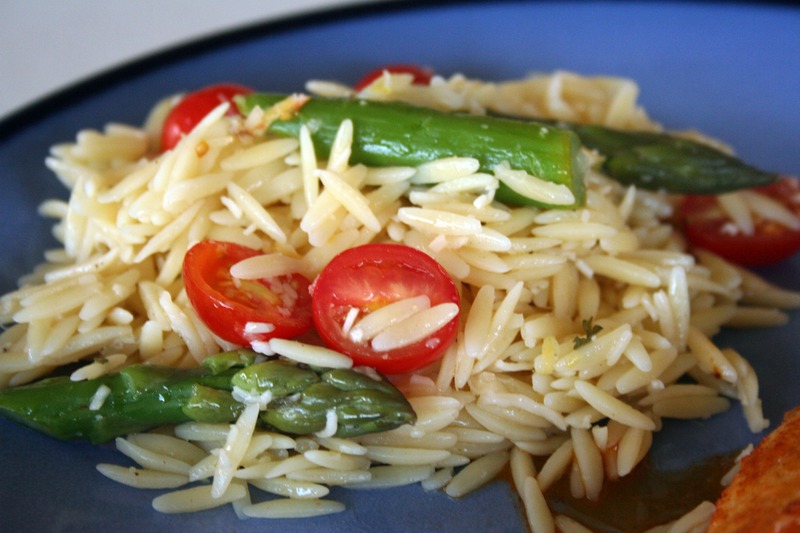 Stir into orzo and vegetables. Stir in parsley and grated Parmigiano Reggiano.